The associate director for Administration is appointed by and reports to the director of the Lurie Cancer Center. This position is responsible for overall administrative operations, including finance and accounting, purchasing, human resources, information systems, plant operations, research safety and security, public affairs and communications and office support systems, as well as oversight of development programs and affiliated organization relations. He is a full member of the senior leadership team and, via membership on the Executive Committee and Leadership Group, is a key contributor to setting strategic direction, policy and priorities for the Lurie Cancer Center. Zafirovski has previously been instrumental in driving the efforts that led to the successful launch and continuing expansion of the Northwestern Medicine Developmental Therapeutics Institute in the Lurie Cancer Center. 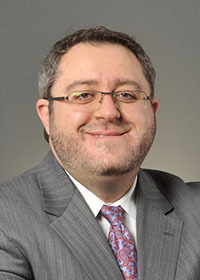 Since joining Northwestern in 2001, Zafirovski has also served as administrative director of the School of Radiation Therapy and director of Oncology at Northwestern Memorial Hospital. His areas of responsibility were consistently rated among the highest in terms of employee engagement and patient satisfaction. He received a Master of Business Administration degree from the University of Notre Dame. A recognized leader in oncology administration, Zafirovski is active in local, regional and national professional societies and has given numerous related lectures.